SHORTLISTED FOR THE JAMES TAIT BLACK PRIZE FOR BIOGRAPHY and THE ELIZABETH LONGFORD PRIZE FOR HISTORICAL BIOGRAPHY'A thrilling account' The Times'As heroic as Digby himself, Moshenska has defied the tyranny of genre and made his own absorbing account' Observer'A master storyteller. Full of exquisite details, but with the grandest themes... this is a gripping adventure story' Zia Haider Rahman'A brilliant account of one of the seventeenth century's most dashing lives' Ruth Scurr'Gripping and extraordinary' Ann WroeOn the 16th of August 1628, five battle-scarred English ships sailed into the harbour of the Greek island of Milos. Dropping anchor, the 25-year-old captain banqueted with the local lord before sitting down to write an account of his journey - an account that would transform him entirely. Sir Kenelm Digby was one of the most remarkable Englishmen who ever lived: a trusted advisor to the King, but the sworn enemy of the all-powerful Duke of Buckingham; a pioneering philosopher and scientist, but committed to the occult arts of alchemy and astrology; a friend not only of Ben Jonson, Thomas Hobbes and van Dyck, but even Oliver Cromwell. He was also widely known as the `son of a traytor and husband of a whore': a man who witnessed his father's gruesome execution for high treason as a Gunpowder Plotter, and the lover of the most celebrated beauty of the age, Venetia Stanley. In an attempt to clear his name, and on a quest for personal glory, Digby assembled a fleet and set sail for the Mediterranean: a world of pirate cities and ancient ruins where people, ideas and exotic goods moved freely between languages and nations. His journey - encompassing fevers, mutiny, piracy, daring rescues and heroic sea battles - is a great and terribly overlooked adventure, and a prism through which to view England, and all of Europe, during one of the most pivotal periods in its history. 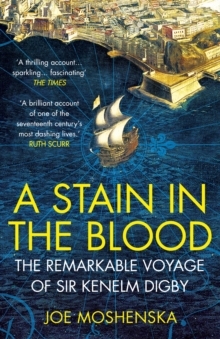 A Stain in the Blood is the story of an extraordinary life, and of a journey that helped to shape a nation. It is a revelatory first work of non-fiction by one of the brightest young writers and thinkers of today.